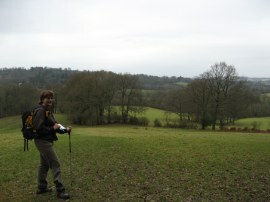 The first group walk of 2011 saw four of us setting off from Cuckfield along the second stage of the High Weald Landscape Trail. 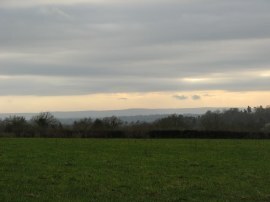 We had earlier met up at Minepit Wood, nr West Hoathly, before taking one of the cars over to Cuckfield where we had finished our walk along the first stage back in November. Apart form a few brief sunny intervals it was a generally cloudy day with a steady wind blowing. 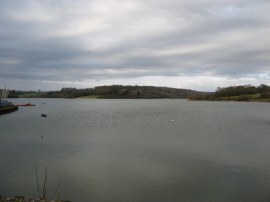 After all the recent cold weather it was also very mild, the temperature around 11-12c throughout the day. From the free car park on Broad Street we turned to the left down to the High Street, photo 1, before heading to the right along Ockenden Lane where we soon the rejoined the route of the High Weald Landscape Trail as it heads along a track, running by houses, that soon leads out to open fields. The route heads downhill across the field with the trees of New England Wood away to the left, and reaching the bottom of the hill heads through a small band of trees, crossing over a very small stream, photo 2, before heading uphill over fields on the other side of the valley. In places the path was very muddy and slippery as were the majority of paths we crossed over during the day. Leaving the fields, the route heads passed a few houses up to Whitmans Green. Crossing the road the route continues along a small lane before joining a footpath on the left that runs round the edge of a field before bending round to the left through a patch of trees. This joins a path running downhill over a grassy slope, photo 3, which soon leads to a path running alongside the fairways of Cuckfield golf course with good views across the countryside to the north. Reaching the end of the golf course there was a steep drop down a muddy bank to join a broad hedge lined track where the route heads to the right to join Sparks Lane although looking more closely it seemed the actual path may run along a footpath than runs parallel to the lane and would have avoided the rather muddy descent down into the track itself. At Sparks Lane the route continues ahead to the end of the road before heading to the right along Brook Street. After a few yards the route heads to the left along a track that leads up to some abandoned farm building which looked ripe for conversion into housing before heading out to join a field edge path, photo 4. This path heads through another small area of trees before heading uphill over a couple of grassy fields to reach a surfaced farm track. Here a sign warned that the route ahead was closed for works for a short distance a couple of hundred yards ahead. 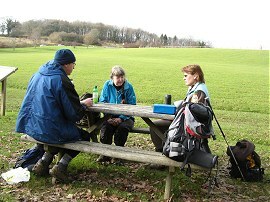 Having stopped for a short snack break by a unusual looking tree we decided to continue ahead along the High Weald Landscape Trail route, which follows a track that bears off to the right rather than take the signposted diversion which proved to be a good choice. Near the start of the track we were able to spot the Ouse Valley Rail viaduct in the distance to the left. This viaduct was built in 1846 and is 1475 feet long, 96 feet (29 m) high and is carried on 37 semi-circular arches with pierced piers and apparently contains 11 million bricks. 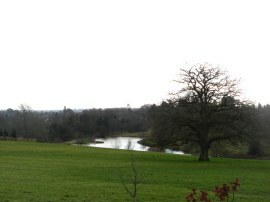 The track headed gently downhill, with a fishing lake visible to the right, photo 5, before passing by lawns and gardens of Borde Hill house. Reaching a gate the route heads into the car park for the gardens before heading down the old driveway to reach Bordehill Lane. While there was a new building being constructed to the left of the car park none of us could see anyway that these works warranted the diversion of the path for a period of months. Considerably more hazardous was the short stretch of road walking to the left along Bordehill Lane down to Copyhold Lane as there was not much of a verge in places and there was a fair amount of traffic was travelling quite fast along the road. Fortunately the much quieter Copyhold Lane was soon reached, the route following the lane off to the right for some distance with the tarmac surface providing some welcome respite from the muddy footpaths and waterlogged fields. 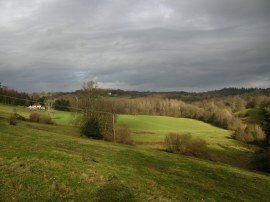 Eventually, having passed over the rail lines and by an attractive cottage, the High Weald Landscape Trail leaves the road, linking up with the route of the Sussex Ouse Valley Way for a short distance along a footpath that heads off to the left. This heads down to reach a small wood before crossing a stream to head up over a grassy field to join a track by River's Farm. 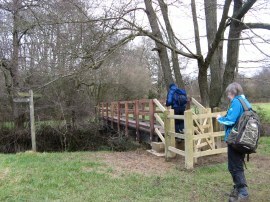 The route crosses over another rail line and continues ahead through the larger area of trees of River Wood before descending over a small grassy area to reach a wooden footbridge, photo 6, over the river Ouse. 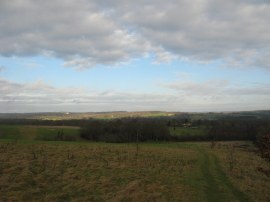 Here the Sussex Ouse Valley Way heads off to the left while the High Weald Landscape Trail continues ahead over the river. The newly built kissing gate at the end of the bridge was quite narrow and I had to take my rucksack off to fit through before putting it back on as I crossed over the bridge only to spot another similarly tight kissing gate at the other end of the bridge. 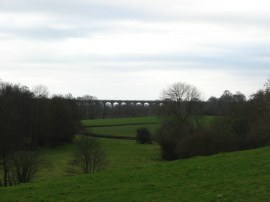 The route then heads gently uphill along the edge of a couple of fields, from where there were further views back to the Ouse Valley Rail viaduct, photo 7, before reaching Ardingley Reservoir, photo 8. We diverted ever so slightly off route to walk across the top of the reservoir retaining wall for a short distance before descending diagonally down over a grassy area towards a small picnic area below the reservoir where we stopped for lunch, photo 9. 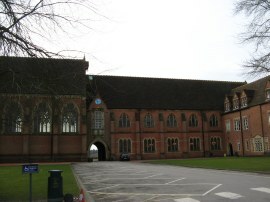 After a pleasant lunch stop we rejoined the path as it headed through a scrubby area of ground to join a track that heads uphill through the grounds of Ardingley College. 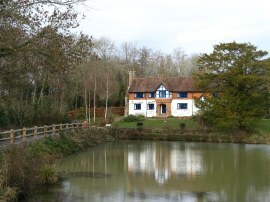 The track passes an attractive cottage by a pond, photo 10, before heading round the college buildings, photo 11, to reach College Road. Crossing over the road the route continues ahead past the school playing fields and into a patch of woodland where every side path off the very muddy main track was obsessively labelled "Private no right of way". Leaving the trees the path heads across a small field before heading to the left at the field edge. Passing through a gate the route then crosses over another larger field once again heading gently uphill as the High Weald Landscape Trail heads between fields towards a small group of houses on the outskirts of Ardingley to join a lane that runs up to Lindfield Road. Here the route heads to the right along the road before heading up a driveway on the left. 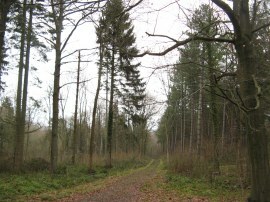 This tarmac track runs through an area of trees before heading out between grassy fields towards an isolated house, Withyland, at the far end of the drive, photo 12. As we were walking along this stretch we could hear the occasional whistles from the trains on the Bluebell Railway although these remained out of view behind the hills to the right. Reaching the house the route leaves the driveway and joins a footpath that skirts to the right around the house before heading downhill to cross a small wooden footbridge over Cob Brook. 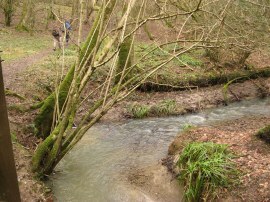 We then squelched back up the other side of the valley along a waterlogged field edge path. Heading into a second field we saw a herd of deer away to the left which is something I have not seen that often in this part of the world. Heading alongside a couple of more fields the route reaches the buildings of Pickeridge Farm before heading up to Hook Lane. The route continues ahead along the road before joining a footpath on the left that heads over a fairly level field from where there were good views towards the South Downs, photo 13. After heading through another very muddy gateway, photo 14, the path heads downhill across the next field to enter into another patch of woodland, the path heading down through the trees to once again cross over Cob Brook, photo 15. The path then starts ascending again through the trees and along the edge of a small field before heading to the right along a more level path running through a larger area of woodland. In places the path through the trees was lined by large numbers of rhododendrons which would look very attractive when in flower, and also by areas of bamboo. 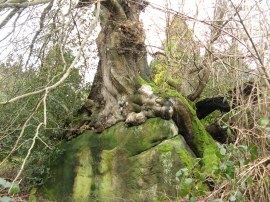 Along this stretch of path we also spotted the tree in photo 16 that appeared to be growing out of a large rock. The woodland path passes a house by a large pond that can just be seen through the greenery away to the right before heading round to the right where the route once again starts rising through the woodland, passing a number of ponds besides the path. It was a rather muddy slog uphill through the trees before a surfaced track is reached by Philpots Farm and Philpots Manor School. This driveway soon becomes broader as we passed the entrance to Lambs Philpots Quarry which is the last remaining Wealden Sussex Sandstone extraction site. The quarry itself was reasonably well hidden from the road behind a hedge and occasional areas of fencing making it quite difficult to look into the excavation itself. 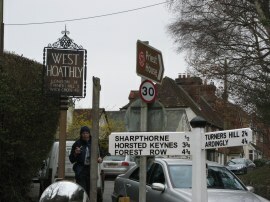 At the end of the driveway the route joins a road which is followed round to the left to reach the village of West Hoathly. 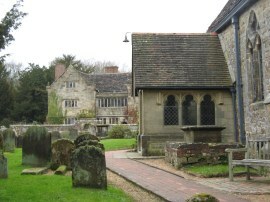 We followed the road past the Priest House, which houses a small museum and the attractive stone Manor House opposite Margaret's Church, photo 17. Here we made a short detour through the churchyard from where there were good views over the surrounding countryside, as well as the churchyard itself which descends steeply to the bottom of the valley. 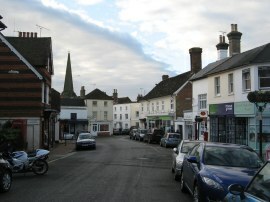 We then continued on through the village along to the end of North Street at its junction with Chapel Row, photo 18. Crossing the road the route joins a track that heads down past a classic car garage and restorers. Leaving the track the route heads downhill across a field, photo 19, to join the field edge which is then followed down alongside another field to reach yet another small wooded area with a stream flowing through the bottom. The path was once again very muddy and slippery as we headed through the trees and along the edge of a field to reach a section of path that runs between two ponds although these remained hidden from view. 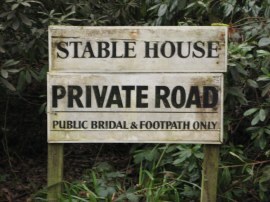 Leaving the ponds we joined an enclosed footpath that heads uphill along the other side of the valley, skirting round the grounds of Gravetye Manor to reach another driveway where a short distance ahead was a signed "Public Bridal and Footpath only", photo 20, although I did not spot any brides using the path while we were there. 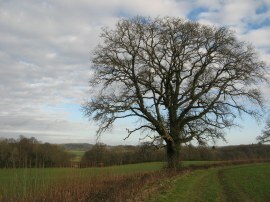 The High Weald Landscape Trail heads to the right along the drive as it heads through Warren Wood and a short distance past Home Farm leaves the tarmac to join a track on the left that heads through the trees of Minepit Wood, photo 21. Shortly after the route had passed under some overhead electricity cables we left that path and took a track that headed up through the trees to our parking spot close to Vowels Lane. Reaching the cars in Minepit Wood we had walked a total distance of 13.1 miles of which about 12.5 had been along the route of High Weald Landscape Trail. 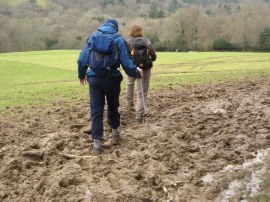 I think this walk can be summarised as Muddy Paths, Waterlogged Fields, Unseasonably Mild. This was another area I hadn't walked in before and it did have a certain charm with the sloping fields heading down to cross narrow wooded valleys, often with a small stream running through. It had also been nice to be back out with everyone again along the trail. 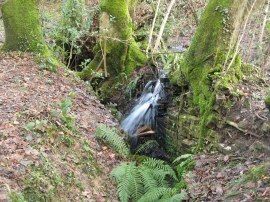 I have uploaded the route of the walk which can be accessed here HWLT stage 2 Route.